Partners in Learning: The Great Courses Delivers $13K to Help Local Adult Literacy Programs in Washington D.C. The Great Courses—a Northern-Virginia-based educational company—delivered more than $13,000 to help fund two local adult-literacy programs in Washington D.C. as part of their education-focused philanthropy and corporate outreach program. 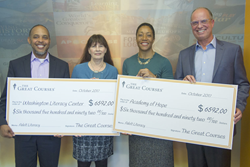 Last week, The Great Courses—a Northern-Virginia-based educational company delivered more than $13,000 to help fund two local adult-literacy programs in Washington D.C. Raised as part of the company’s education-focused philanthropy and corporate outreach program, the funds will go to Academy of Hope and the Washington Literacy Center to help D.C.-area adults improve their literacy skills. “I cannot tell you how delighted we are to be able to make a positive impact on adult education in our local community.” said The Great Courses President and CEO Paul Suijk. “We’ve long benefited tremendously, as an organization, from being located in the Washington D.C. area and having ready access to the best-educated workforce in the country. Giving back to the community by helping improving the education levels of the city is simply our responsibility." The Great Courses is the nation's leading developer and marketer of premium quality media for lifelong learning and personal enrichment. Delivered in engaging, expertly produced video and audio, these carefully crafted courses provide access to a world of knowledge from the most accomplished professors and experts. The content–rich, proprietary library spans more than 600 series with more than 14,000 lectures designed to expand horizons, deepen understanding, and foster epiphanies in the arts, science, literature, self–improvement, history, music, philosophy, theology, economics, mathematics, business, professional advancement and personal development. Creating unique learning experiences since 1990, The Great Courses and The Great Courses Plus are the premier brands of The Teaching Company Sales, LLC of Chantilly, Virginia, which is owned by Los Angeles-based Brentwood Associates. More information can be found at https://www.thegreatcourses.com.